This is how staying an Wallowa Lake was meant to be; a 3 bedroom, 1 bath 1930's cabin that offers a quiet get-away. 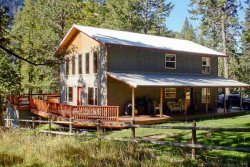 Relax to the sounds of the Wallowa River from the large lot and deck. Enjoy the charm of the knotty pine walls and ceilings. The fir floor and areas rugs feel good underfoot and you'll feel pampered by the leather couches and other furniture. There are 3 bedrooms on the North side of the cabin. A fully equipped kitchen (with dishwasher) is open to the living room on the South side. This cabin is in a great location close to the river with nice views from the deck. It is within walking distance to the lake and other activities including hiking trails! Come to this charming cabin in the woods and enjoy all that Wallowa Lake has to offer!